This is James Madison Plaza and I assume it looks more inviting when the weather is nicer. The Parks Department entry for the Plaza consists mainly of information about James Madison, our fourth President, so one would assume that the Plaza was named for him. 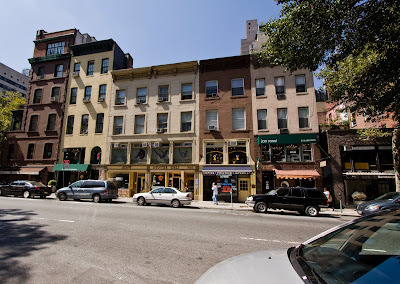 So it is strange that they claim it is named for the combination of the names of two of the streets that bound it: Madison Street and St. James Place. 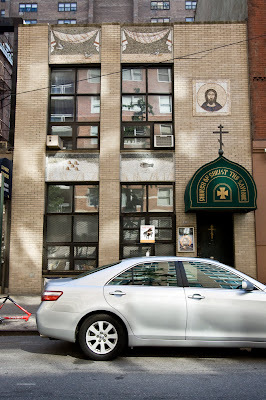 St. James Place is named for a nearby Catholic church. 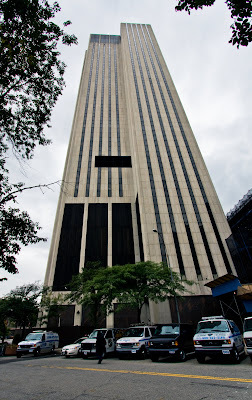 Right across the street from the Plaza is one of the most reviled buildings in Manhattan - the Verizon building. 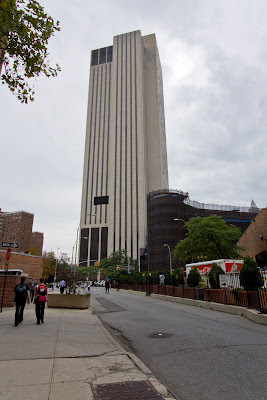 To call it one of the ugliest buildings in Manhattan is surely wrong, but it's just too damn big. 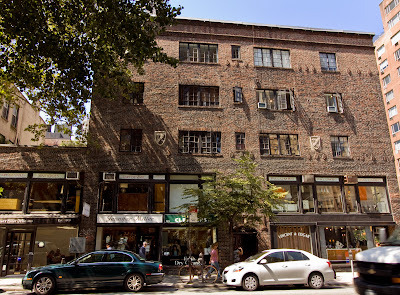 It towers over the Brooklyn Bridge, diminishing the effect of the view of it and it overwhelms the neighborhood. Here it is in a more distant and less scary view. This is looking at it from Pearl Street back at Park row. 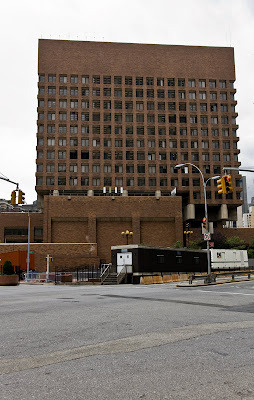 This is Police Headquarters, built in 1973 by Gruzen and Partners. The AIA Guide says it is one of the "most urbane civic buildings since the City Hall of 1812," but then goes on to say it's "largely because of its elegant . . . plaza . . ." More about that plaza on another walk (in fact, one I took today). This is the back of the building and when I took this shot, I wasn't even aware of the plaza. But as for the building itself, it just doesn't say "police" to me. It's almost too cute. Or something. Can't you see it as a piece of furniture? Here, we see past the Headquarters to the Municipal Building and the U.S. Courthouse. I don't know what that low building with the aqua bands is; I haven't even seen it before, but I'll find out. And here on the other side is the clearest view I've had yet of a new building going up. I asked a guard sitting in one of those little stations if he knew what it's going to be. He said some people think it's going to be dorms and some people think maybe it's part of the hospital, but he, himself, thinks it'll probably be housing since it's so tall. He says, it just keeps going. He says it's really going to change the area. This is Chatham Green, Inc., a co-op built in 1962. Francis Marrone in his Architectural Guidebook to New York City in seeming approval, called it "an undulating Great Wall of Chinatown." Apparently they are floor-throughs. Wow. Windows and balconies in every room and cross ventilation. 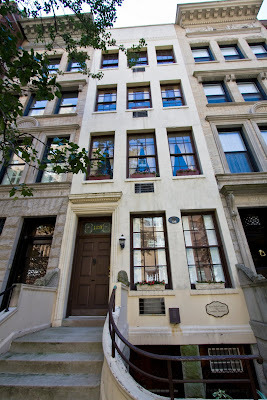 I lived in a floor-through in Carroll Gardens which was awful in every respect except for the cross ventilation. It almost made it worth it. I think of it now with a pang of loss, knowing I will never have that again. 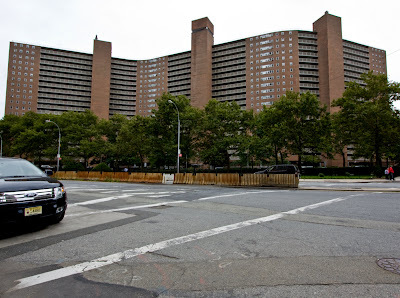 So I priced an apartment in Chatham Green, about the size of mine in Inwood, 1 bedroom, 1 bath, 800 square feet, thinking, why don't I just sell my apartment and move downtown? Like, just trade. The answer, of course, is everything costs more downtown. Prohibitively more. Just as well. Their ceilings look awfully low. 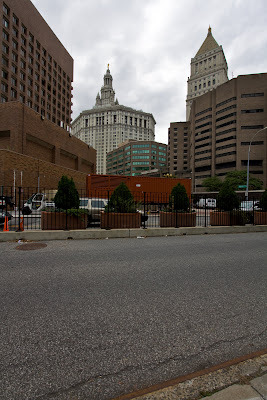 Backing up a little from last night, we're looking at the New York County Courthouse on the left and the U.S. Courthouse on the right, from across Centre Street. Pearl Street runs between them. I've been curious about that building behind the County Courthouse since I began jury duty, so I worked up a little excitement about taking this walk on Pearl Street. Also Pearl Street has long interested me. I knew it was old and it started way downtown and took some strange twists and turns and ended up here. And that name. Somehow it seemed romantic. As you saw last night, the romance must be farther downtown. It's the Daniel P. Moynihan U.S. 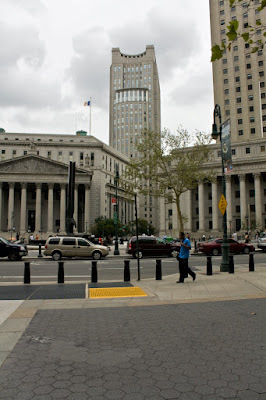 Courthouse, designed by Kohn, Pedersen Fox and completed in 1994. Herbert Muschamp, the New York Times's architecture critic, wrote a thoughtful review that year. He was disappointed, though he praises many of the elements.. He says the architects equate the timeless with the old whereas he wants them to represent the past without sacrificing the present. If you want to know what he means by that, you'll have to read it yourself. Here's the entrance. 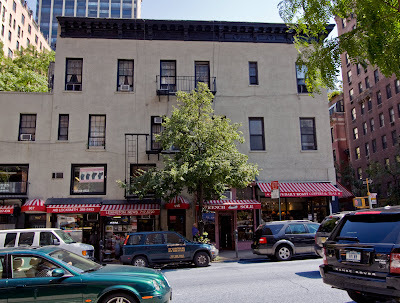 Note that the building is sideways to the street. I just finished my second week of Grand Jury service. Two more to go. 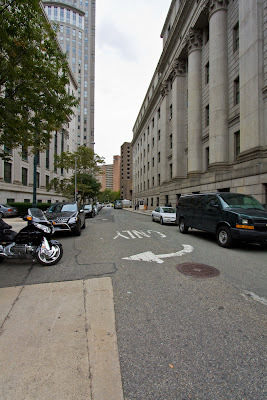 This is generally the way it goes: you get summoned, you go down to 100 Centre Street along with many, many other people, you choose morning or afternoon and they pick jurors by lot. Both times I've been summoned, I've been picked. But here's the thing: I like jury service. I wanted to be picked. 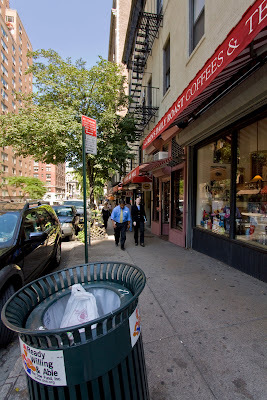 I like being downtown; it has a quieter feeling than other business districts in New York. I like big old temple-like government buildings placed at odd angles on oddly shaped blocks. I like being close by Chinatown. I like doing something different and meeting new people. And I pretty much like jury work. It can be boring at times, but much of the time, it's interesting. You might think I feel this way only because I'm unemployed, but I also felt this way when I had a job. Of course I understand that many people are in difficult situations and it can be a real burden. But I'm not! So I'm having a good time. Plus you get $40/day. That will more than pay for lunches in Chinatown. Morning sessions are 10:00-1:00. I'm still adjusting to early morning hours. It'll be good for me. 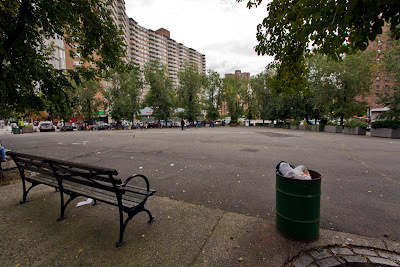 It only takes an hour door to door from Inwood to Civic Center on the A. Not bad at all. 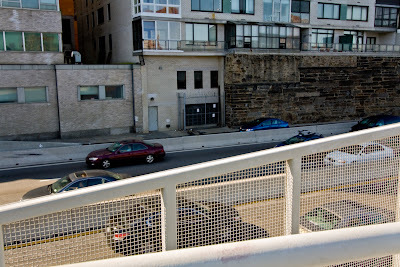 I want to get in lots of photowalks while I'm down here, but that means I'll get more photos than I can handle. I'm just gonna do it. We'll see what happens. Last Friday I went on my first walk. Last Friday was a truly glorious day, even better than today. Crisp, sunny fall day, warm and cool. 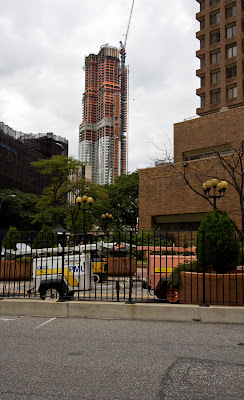 I shot the buildings around Foley Square and then walked Chambers Street straight across to Battery Park City, stopping for a wonderful lunch at Acappella. Since my new camera uses more pixels, I needed a bigger card, so I had a new 4 gig card which held 239 photos and I filled it up. Something about that card . . . I can't access the photos on my computer. This goes a way toward explaining why I was grumpy on Tuesday, when I started this walk. You can see it was a gray day. I was basically doing a reshoot under worse conditions. So after I shot (reshot) Foley Square in a gloomy mood, I decided to forget about Chambers for the time being and go somewhere new. I'll show you Foley Square another night because that will take more writing and we've all had enough for one night. Yes, Grand Jury Service. And with this service comes the answer to a question (implied) I had on May 15, 2007. Namely, what is this building? 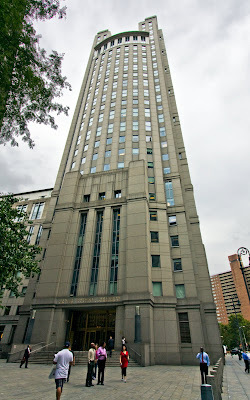 It's the Louis J. Lefkowitz State Office Building. 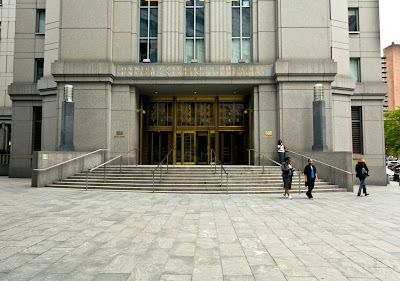 Among the State offices it houses, is the 4th Grand Jury, of which I am a member. And of which, more later. 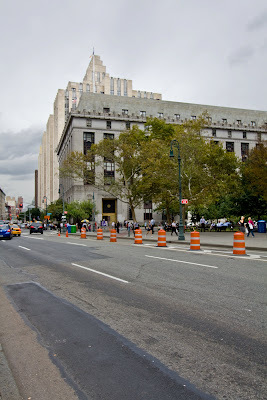 The state architect, William Haugaard, designed this building, under a height restriction placed on it to avoid overshadowing the main courthouses and to avoid disturbing the symmetry of Foley Square. I don't know why this surprises me. I guess it reminds me of Washington, D.C. and New York never reminds me of Washington, D.C. Note: You see there are two buildings in this photograph? I lightened the rear one considerably so that you could see there are two buildings. They were so close in color and shade that they seemed to blend together. I wanted you to be able to see the modest height and design of the State Office Building. I'll always tell you if I do something like that. 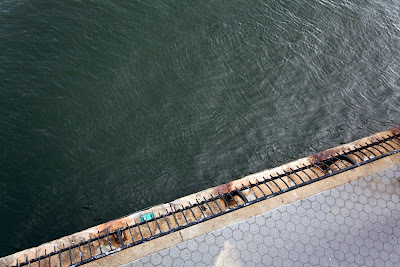 This is the East River? 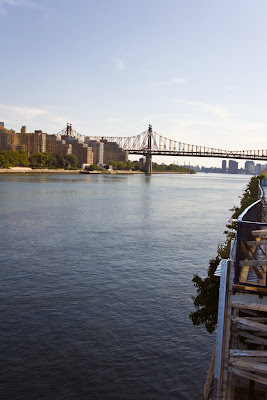 I mean, this is the East River. Doesn't it look tempting? Here's a longer view to help you figure out what you were looking at in the closeup. And now looking south is the Queensboro Bridge. 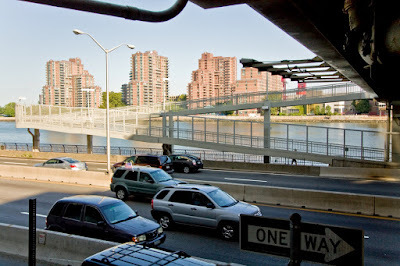 Or if you're feeling groovy, the 59th Street Bridge. These were all shot from the overpass I mentioned last night. Right about here I ran out of, I started to say film, but what I ran out of was space on my card. But here is one last shot of where I walked after I crossed back over. 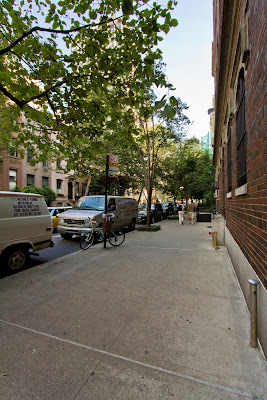 There's a very narrow sidewalk alongside those buildings over there and I walked it from 71st to 73rd (because you couldn't get through on 72nd). It's not that concrete by the red car which looks wide enough, but if you really look hard (or enlarge), you can see a blue car on the other side, and the sidewalk is on the other side of that. Narrow. Tomorrow starts a new walk - and tales of Grand Jury Service! Well, not too many, since we're sworn to secrecy. 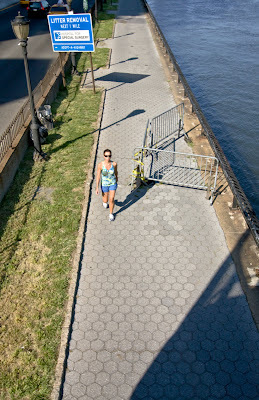 At the end of this last block is an overpass to the walkway beside the East River. I was going to end this walk tonight with four photographs, but I really need to get to bed early tonight, so tomorrow I'll end it with three photographs. Just so you know. 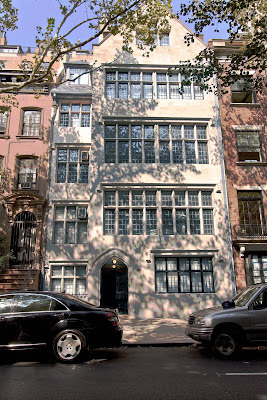 This is the last block on East 71st Street. Looks a little cold, doesn't it? 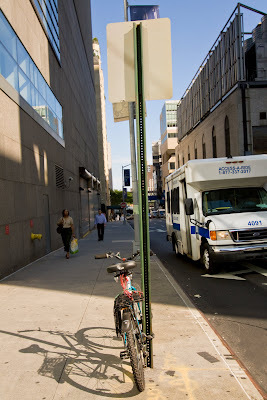 You think a hospital might be on this block? Yep. 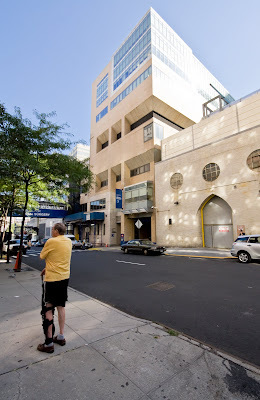 The Hospital for Special Surgery. But it's . . . it's pretty! It began life in 1863 as the Hospital for the Ruptured and Crippled. And here is another surprise. 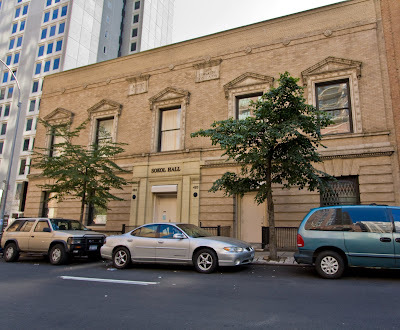 This is a Czech gymnasium built in 1896 and still in operation, though much diminished, since the days of the Eastern European settlement of the Upper East Side. 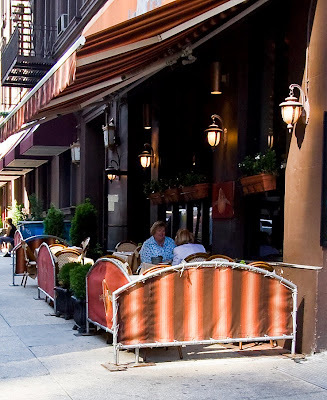 Did you know there used to be more than 40,000 Czech's living on the Upper East Side? 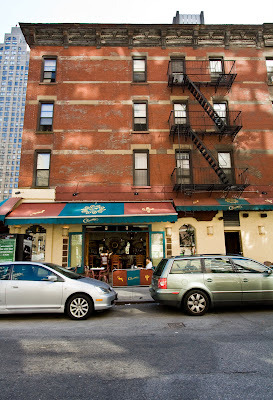 They had moved there from the Lower East Side because the tobacco industry was uptown. Yes! Tobacco. Cigars, in fact. 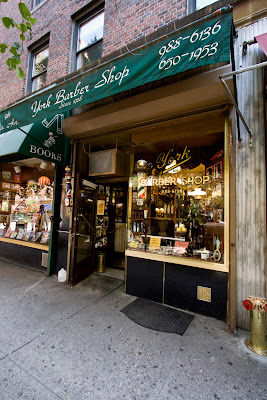 They were cigar cutters and came uptown to cut cigars. What happened to them? Where did they go? Out to the suburbs. Blame New York Hospital, the United Nations and all the rest of the big developments that tore down housing and put up institutions. Christopher Gray had a column about the Sokol in 1989 and said that although there were regular offers from developers, it looked like it would be there "at least for the foreseeable future." That was 20 years ago. There it is. 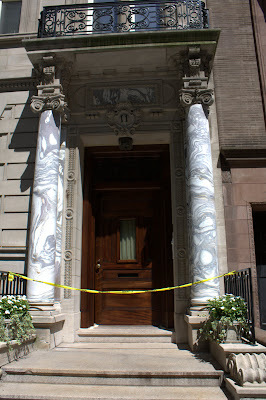 By the way, according to Gray, it used to have a cornice and a portico, but they were "crudely removed" in the 1960's, "probably destroying the building's chances for landmark designation." This is the block between First and York. No surprises here, you think? Well, look at this sweet little antiques store. Sweet but serious. 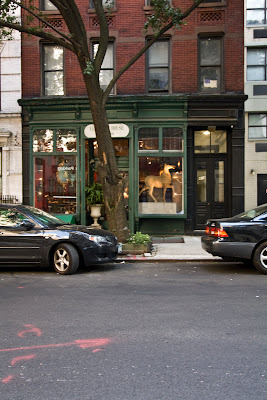 It is Yew Tree House Antiques and they specialize in 17th and 18th century English furniture. Bring lots of money. Such a modest church for such a weighty history. And here we have Cilantro, a modest restaurant. I was interested in this building because I thought even though it's a beat up old relic, it looks better than those boring newer buildings next to it. And it has a cornice. I left it extra large in the enlargement so you can see the details. Check out how the window moldings are mostly gone. Now it's 3:32 and there's no one outside at the mysterious Per Lei. Inside, the bartender relaxes, makes himself a drink. 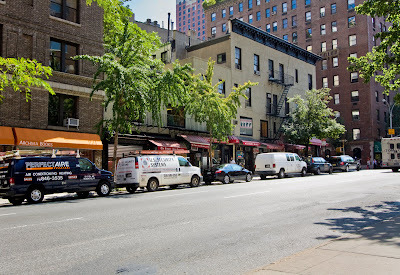 I hate to show you this skewed photograph but you do need to know that Marymount Manhattan College is on this block. Although the college is small, (about 2,000 students), it seems as if there should be more to it than this one building, but, if so, where is it? 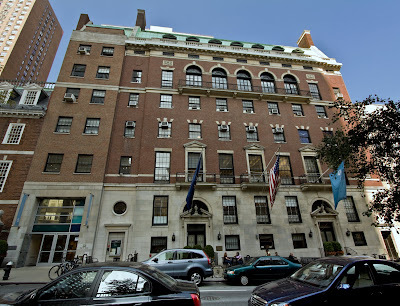 Marymount used to be affiliated with the Catholic Church but now isn't, due to the decision to bestow an honorary degree (in 2005) on Senator Hillary Clinton, " one of Congress's most outspoken and strident advocates of abortion rights." The college was sticken from "The Official Catholic Directory." Well done, Marymount! Also Hillary! Read about it here. Looks lovely, secluded, quiet. It's 3:20 now and it seems they have the place to themselves. It's easy enough to ignore the guys in the truck. 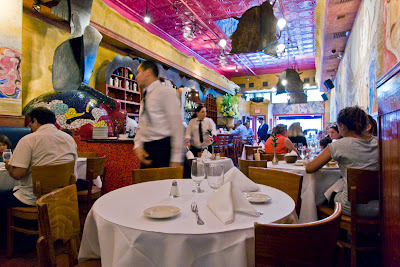 This is Grace's Trattoria, next door to Grace's Marketplace. Lunch over, I'm resuming my walk on 71st Street. This is the block between Lexington and Third. And this is a building on the block. I don't know anything about it except that it's a condominium. Nice windows. 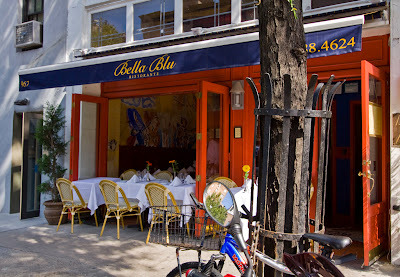 Having dawdled enough, I went back to Bella Blu, and found that, although they weren't as crowded as before, there still was no seating outside. Well, inside wasn't bad. Inside it looked kind of grottoesque, but anytime I can have a glass of wine at a table with a white table cloth and it's not even dinner; it's lunch, I can tolerate a little decorative excess. I had bread salad with tomatoes and cucumbers, very simple, very delicious. Berries for dessert. I'd go back. Here it is after I left. 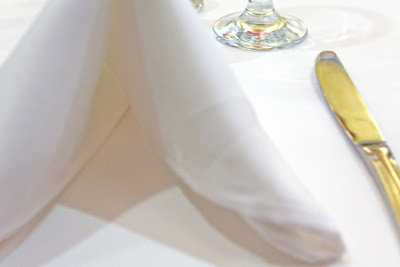 Any table you want. My camera tells me it was 3:02. 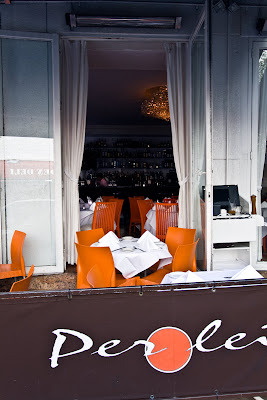 And since they serve lunch until 3:30, that allows plenty of time. 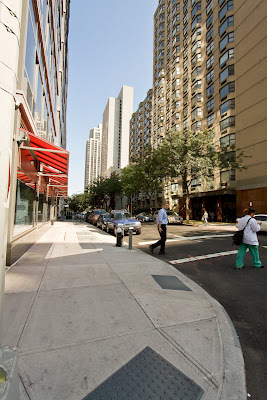 Now I'm walking up Lexington toward 72nd Street. 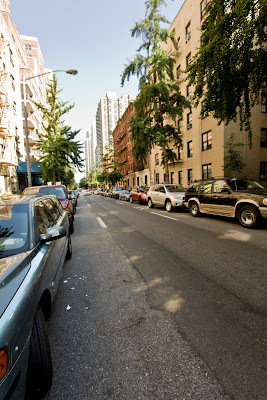 Below are three shots of the block between 71st and 72nd Streets taken from different spots. The first is looking north, the second looking south and the third, across the street, looking east. Would you know they were the same block? 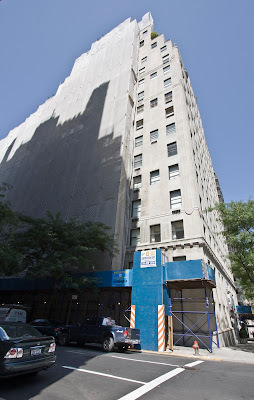 And here is a straight on shot of the building on the corner of Lexington and 71st Street. Isn't it nice? Next to Sam's Souk is York Barber Shop. In tiny type below their name, it says "Since 1928". I didn't walk in and ask for a haircut, but Brooks of Sheffield did. 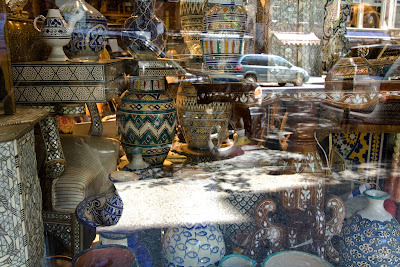 Here's a shot from Sam's Souk's window to provide you a little relief from all those damn buildings. Please enlarge this photo. You won't regret it. The sign in the window said, "Blow Out Sale! Everything Must Go! 70% off everything!!" Unfortunately, I can't buy anything when I'm on a photowalk, because I'm carrying enough as it is. Does this mean he's going out of business? Funny how you can feel a pang of loss even though you didn't know the thing existed until a few minutes ago. 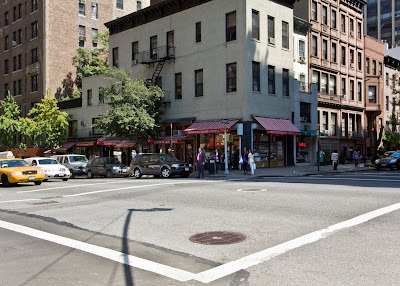 It was after 1:00 and I was beginning to get hungry, so it was a lucky thing that I was approaching Lexington Avenue, the avenue of many restaurants. 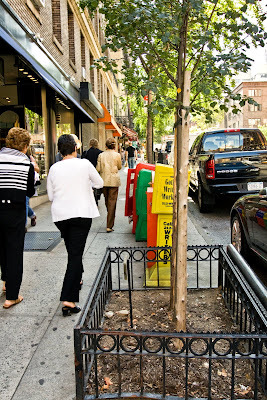 I walked down Lexington to 70th Street and then up to 72nd Street. I had spotted a likely restaurant on the downtown side, but it was a little crowded, so I decided to give them some time. This is the west side of Lexington between 70th and 71st. 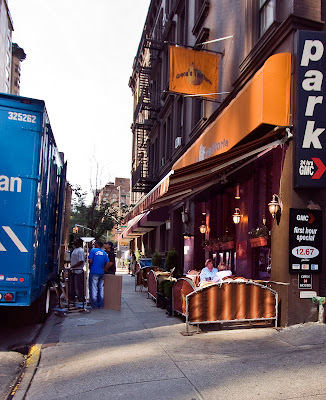 And this is back at the corner of 71st and Lex. I'm trying to give you an overview of the block. I know that many a time you've exclaimed, oh, I just wish I had an overview! Well, here it is. Tonight is Architecture Night; we consider the cornice. You may have thought, as I did, that a cornice is merely a decorative part of a building, the piece which projects from the top of a building and seems to finish it. However, Wikipedia states that it has a function as well, and that is to keep rainwater away from the building. If your building does not have a cornice, it must have other ways to accomplish this, like having gutters, for example. Now notice that our middle building lacks a cornice. Its design is overall more simple. See how the window treatments are simpler than its neighbors windows? But the lack of a cornice creates a silly looking gap between it and its corniced neighbors. And where are the gutters? And it does have a cornice over its doorway. 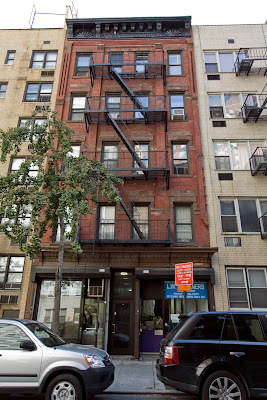 By the way, this is the New York Center for Cosmetic Dentistry. You don't think the gap at the top was an allusion to having a missing tooth, do you? I hope not. 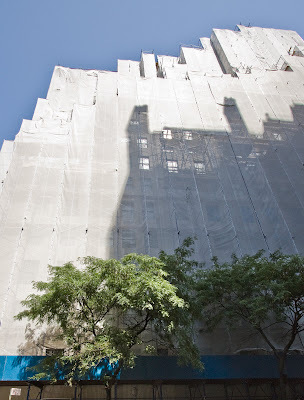 Here're some shots of a wrapped building on East 71st Street. Kind of spectacular in its way. 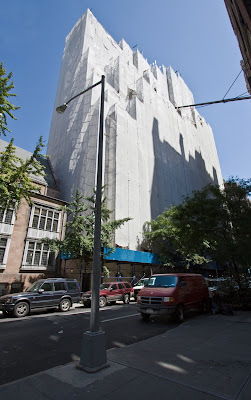 I googled "wrapped buildings" and found Phil Gyford with 93 images of wrapped buildings. But they're in London or thereabouts. 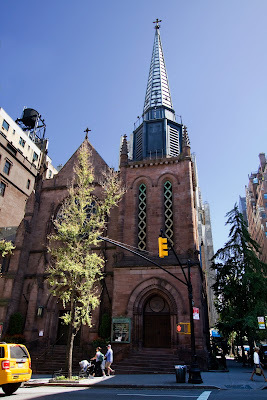 In 1991, Christopher Gray (there's that name again) wrote a Streetscapes article about St. James' Church titled "A Metamorphis Still in Progress," in which he recounts the six or so major changes the church has undergone since it was built in 1885. Among them are switching the front and back interiors and trying to get the steeple right; the one you see here is the third attempt and is "widely considered a failure." The yellow caution banner seems to indicate something is wrong. I'm pretty sure it's those columns.